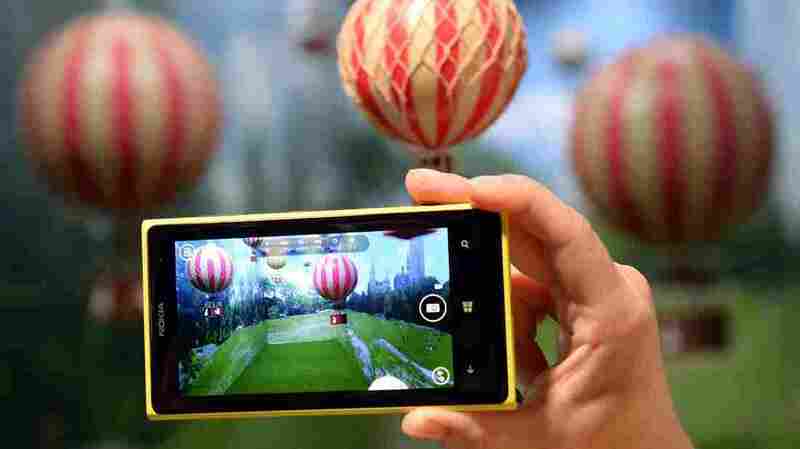 Will Microsoft's Nokia Deal Shake Up Mobile? : All Tech Considered Microsoft is buying Nokia's mobile phone business and licensing key patents for $7.2 billion. Microsoft is aiming to boost its share of the smartphone market, which is dominated by Google's Android and Apple's iPhone. The deal may also provide a hint of who will take over when Microsoft's CEO leaves. Nokia was the only large phone manufacturer in the world to commit to selling phones running Microsoft's operating system. Now Microsoft is buying Nokia's mobile phone business. Nokia was once the largest mobile phone manufacturer in the world, the most valuable company in Europe and an icon in its home base of Finland. But the rise of Apple and Android smartphones knocked the company on its heels. Now comes news that Microsoft is buying Nokia's mobile phone business for $7.2 billion. NPR's Steve Henn answers some questions about the deal. So what is Microsoft getting here? It will get Nokia's entire smartphone business as well as Nokia's large feature-phone business. Nokia still sells more than 50 million feature phones a year. Microsoft will also inherit close to 32,000 employees who are based all over the world, including 18,000 in manufacturing. Nokia is one of the oldest and most storied mobile phone companies on the planet. Microsoft is paying close to $2.2 billion as part of this deal to license tens of thousands of important mobile phone technology patents. It's also buying a license to use Nokia's mapping service, called Here. It is a big deal within the industry. And it's not just a big deal for these two companies. If you're Samsung or HTC, which are also major smartphone makers, suddenly every big company out there that makes software for smartphones now owns its own device manufacturer. It's kind of like getting caught standing in a game of musical chairs. Industry analyst Horace Dediu at Asmyco in Finland called the deal "a seismic shift, a tectonic shift ... that will have repercussions all around the industry." You mentioned 32,000 Nokia employees will now be working for Microsoft. They will include Stephen Elop, the now former CEO of Nokia. It was only three years ago that Elop left Microsoft to take the job of CEO of Nokia. Shortly after arriving, he wrote a devastating memo where he compared Nokia's situation to a crew of oil workers standing on a burning oil platform in the North Sea. He said the company was losing market share to rivals like iPhone and Android and it had no other choice but to jump — to abandon its software platform and to adopt Microsoft Windows Phone. Nokia was the only large phone maker in the world to commit to selling phones running Microsoft's operating system. In effect, Elop tied his company's fate to Microsoft's mobile phone business. It didn't go well. Now, three years later, Microsoft is buying that business — and Elop will return to his former employer. Elop is not loved in Finland. While he was presiding at Nokia, lots of jobs were lost, the stock price tanked, the country lost a lot of tax revenue. But he was able to preserve some value in Nokia's brand. And since Google paid $12 billion for Motorola, you could look at this as Microsoft getting a deal for similar assets for $5 billion less. One fascinating nuance of this is that now Elop has emerged as one of the leading contenders to replace Microsoft CEO Steve Ballmer, who announced just recently that he's going to retire. What does this deal mean for consumers? For consumers, it's probably a good thing. By buying Nokia, Microsoft is ensuring that there are going to be three viable choices in the market for smartphones instead of just two, with Google's Android and Apple's iPhone. Nokia was burning through its cash — many people expected it to run out of cash sometime in 2014. And without a lifeline from Microsoft, the future for Nokia wasn't bright. But without Nokia, Microsoft's future in the smartphone market wasn't very bright either. There aren't very many companies that have fully committed to selling Microsoft's smartphones. Ballmer has been saying for more than a year that he wanted to make Microsoft a devices and services business. This deal, when it closes, will actually do that. Microsoft will soon be making millions of devices each year.